After the election, Trump supporters felt happiness and relief. The other side felt the opposite. In fact, Mayor Hodges of Minneapolis encourages rage over Trump election. Here is the post. It has been speculated that Mayor Hodges is nervous about Trump’s promise to stop funding “sanctuary cities.” A sanctuary city is where there are rules keeping local and state government from letting federal authorities know about people who have entered the country illegally. 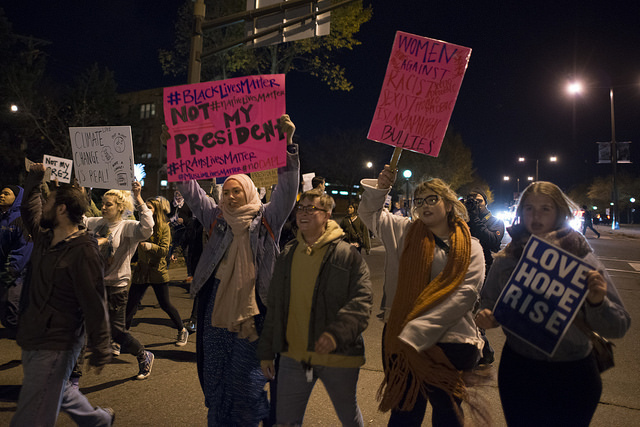 Hundreds of people marched through St. Paul on November 10th, protesting the election of Donald Trump. Protesters took it so far that they blocked the Green Line train tracks. The Black Lives Matter of St. Paul Facebook page shared the event. At least this protest was peaceful. Many other protests across the country were not. In Chicago, Trump supporters were attacked and it was filmed. Whitelash is a popular term that people are using to describe the Trump election. A close look at the statistics tells another story. According to the Washington Post, over 200 counties that voted for Obama both times flipped over and voted for Trump on November 8. Obama received Minnesota’s electoral votes in 2008 and 2012 by a large margin. This year it tightened up a great deal as Hillary Clinton was only able to win by 1.2%.